Each of the following online donation options will redirect you to the CanadaHelps website where you can complete your transaction. We thank-you for your support! Your support is greatly appreciated! Your gift will support much needed work supporting gender equality and human rights. Provide ongoing support and be part of VIDEA's wonderful team of human rights defenders. Give a gift in the name of a friend, family member, or co-worker. Show your love and respect for those you love most and pass it on. If you would like to make a donation through letter mail, please send a donation form with your donation to VIDEA, 1200 Deeks Place, Victoria BC, V8P 5S7. Supporting sustainable development begins with you! VIDEA supports long-term development focusing on sustainable initiatives emphasizing gender and human rights. We couldn't do the work that we do without your generous support! This one represents 15 kilometres of walking and up to 8 days of work. It also holds education for girls, food security for families, and economic independence for women! 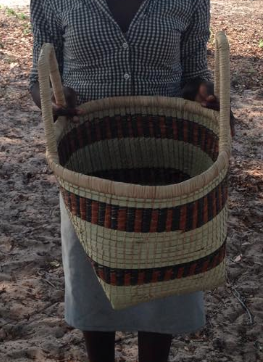 VIDEA is able to support groups, like this basket weaving co-op because of your generous support.